Bolt was hired as general contractor to install three (3) 3616 Caterpillar compressors at a natural gas compressor station in Waynesburg, Pa. As many as 60 workers were involved in the project. 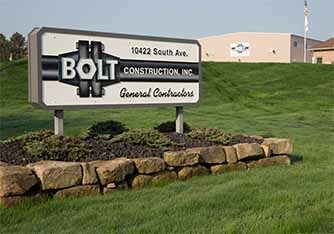 Bolt was in charge of electrical, civil, insulation, painting, as well as mechanical installation. During the first month of the project, workers were held up with 26 days of rain. However, by relying on its workforce, Bolt was able to makeup the lost time and completed the project safely by its October 2015 deadline, meeting the customer’s expectations. Bolt was contracted for mechanical work for the Carpenter Compressor Station in West Alexander, Pa. Bolt utilized much of its own equipment, as well as outside crane rentals, to install three (3) 3608 Caterpillar compressors, and three (3) 3612 Caterpillar compressors. The station compresses natural gas and separates liquids to eventually end up at a processing plant. This station was constructed under a very tight time frame with a large number of personnel on-site. A full-time safety representative was dedicated to this site as well as a full-time QC manager. This project was constructed on a seven day per week schedule in order to meet the customer needs. The project was completed safely and within budget, and met its January 2015 deadline. In Nov. 2013, Bolt was contracted to complete general contracting and piping installation at the Charlotte Douglas International Airport fuel farm’s jet fuel storage and dispensing system in Charlotte, North Carolina. The challenge was to replace the old fuel system with the new system without interrupting the continuous flow of fuel to the airplane ramp. Using six (6) 1000 gal. min. pumps, six (6) 1200 gal. min. filters, numerous flow control valves, and block and bleed valves at the pumps and tanks, some 30 Bolt workers and subcontractors were able to upgrade the facility while keeping the airport supplied with fuel. Bolt completed the project safely by its August 2015 deadline, meeting the customer’s expectations.